A late start to the season this year with rough seas holding us back until Jan 1 to get the Pots in the water. A quick spray paint of the once red bouys to freshen them up, fitting of the tags and in they went. Despite quite a few attempts and working on some “Big Ones” for hours, Brendon only managed to snaffle one .8kg cray snorkeling. Andrew gets the “Light Year” award for a single cray, but was a stoic contributor for his devoted efforts helping everyone else with their pots. Did the modified security screen door make the difference, or was it just luck? Richie got the “Houdini award” for his disappearing act, stepping into a chest deep hole in the reef. Trevor gets the “Sweep award” for his efforts trying to catch a few Sweep to eat, topping up the catch with some fish. Bruce gets the “Score of the year award” for catching the biggest cray at the local golf club raffle. 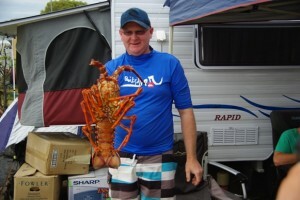 He also gets the Yabbie award for his effort in catching the most undersized crays in his pot. Simon gets the “Fast Start” award for catching the most crays in the first few days and then being the first to end his season. Jenny and Maree get the “Learning and Development award” for working out how to start the cray boiler. Our bumper day was on Jan 8 with 5 crays weighing in at 4.5kg. The total tally of 15.5kg from 18 crays was a little disappointing, but the fun is in the catching. The season now done, we can all look forward to next Christmas. Trevor made it on the board today with an 850 gm score, the only one today, despite Bruce trying to sneak one in past scrutiny 3.5mm undersized. Back to the ocean Bruce, that one will have to grow a little yet. A special challenge was included in today’s event called “Dodge the BlueBottle Jellyfish”. That made things a little interesting. Off to a slow start with Simon the only success with a small 650 gram cray. However, Bruce did try to convince the Tally Master to include a number of undersized crays because he’d scored a number of them. Sorry Bruce but no way! Well although we missed a year, here is the 2013-2014 Tally. On day 2 Bruce leads the tally on both weight and quantity. How long will it last? Jan 3, Trevor as biting at the heels of the leader. Keep a watch for the updates. A few lay days ahead with rough weather forcast. Simon has pulled the pin due to his return to Vic. Been a bit lax on updates. Jan 14. Brendon’s Pot is now MIA, after 5 days out in wild water. Probably tangled in kelp somewhere. Smaller swell has allowed for snorkelling to boost the tally. Trevor has been a reliable source the last week. This is the count for the Christmas catch of crayfish for the 2011-2012 season is 28 kg. Not as good as last years 37kg but still a good haul. And the Newbie Encouragement Award goes to Bruce Hemmingway due to his impressive antics on the reef, and constant encouragement from Jen – “Go on Bruce!”. Awesome job on the crays guys, so jealous. Robe seems like an awesome spot. Camper trailer build in progress now . . . . . . .
What about a special mention to Chrisanne for rescuing the cuttlefish from the rubbish, cooking and eating it! There’s an effort not many would repeat! What do you do with the cuttlefish?? Chrisanne Hall cleaned it, scored it and marinaded it in milk for the day then cooked it on the BBQ. They said it was lovely.